the daughters and i went to hawthorne street, on the east side of portland, the other day. we parked around 37th and walked a few blocks up and down hawthorne, going into a few of the shops. this photo was taken from inside of a little cafe called bread and ink. the bread and ink has been in business since 1983. peter and i use to go there when we did saturday food shopping. and one of our food stops was pasta works, which still has the store on hawthorne. 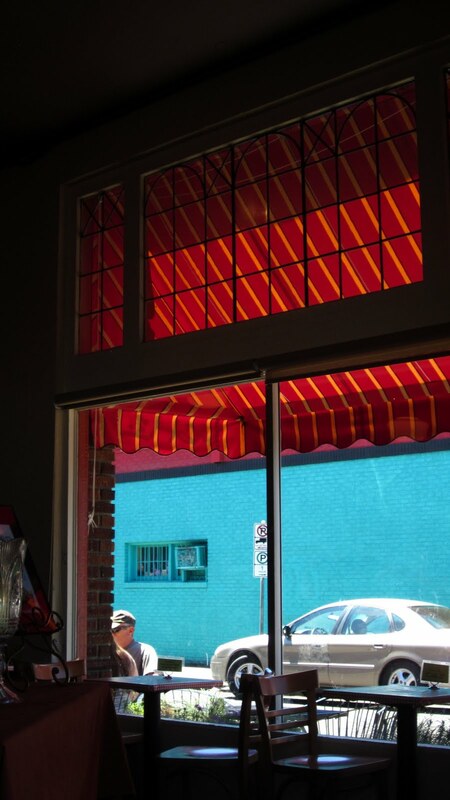 the girls and i enjoyed lunch, and i thought that this was a very colourful view, through the side window, with the blue and magenta building across the street along with the red and yellow awning on the cafe window.